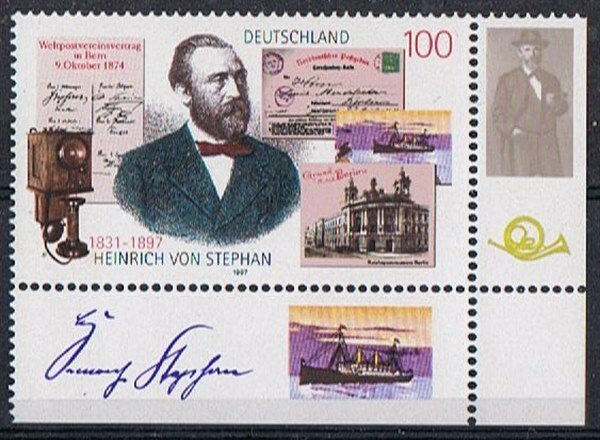 Germany issued in 1997 one stamp for the 100th Anniversary of the dead of Postmaster Heinrich von Stephan (1831-1897). He introduced the postcard in Germany of which one is depicted on the stamp, it shows us a passenger-cargo vessel, which has not be identified so far I know. It is a very small image and the only thing it looks that her two funnels are yellow which belong to the Hamburg Amerka Line. She has a straight bow so it must be a vessel from around 1900. German 1997 100 pf sg 2764, scott?